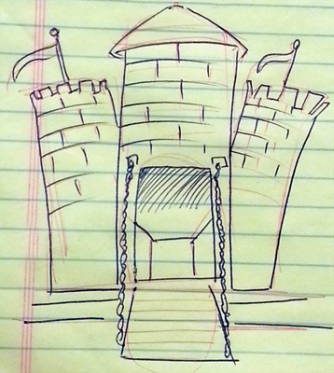 Draw your idea of what a castle looks like. Trace it onto a sheet of cardboard; cut out the shape, and build a mold with cardboard in the shape, (the same way we created the 3D letter), create walls (but no "ceiling") to the shape, taping the sides and corners, ending up with a mold that looks like a dish or tray. Add details (the shapes of the bricks, turrets, drawbridge, etc. ), with scraps of cardboard, pasted over the lines drawn on the cardboard. In another dish or bowl, mix the sand with a solution of White Glue and water,and pour it into the mold. Let it sit overnight in a warm, dry place, then tear the mold from the sculpture, and clean up the details. Place a bent paperclip into the back of the sand casting, which will act as a hook, upon drying. The recipe for the sand solution is 1 Tablespoon of white glue, 2 Tablespoons of water, mixed with 1 cup of beach sand. It might take more water, if the sand isn't damp. Mix the glue and water first, making sure it's smooth, then slowly mix in the sand, constantly stir the mixture to ensure all of the glue-water permeates the sand. Pour the sand into the mold and set it in a dry place for a few days until all the water evaporates out of the solution, then remove the sculpture from the cardboard.